They can help governments achieve the outcomes they want. But they have their downsides. For the past 20 years or so, we’ve seen a growing demand for accountability in the public and nonprofit sectors. It’s not enough to document your program’s outputs—say, the number of students who took a class, or the percentage of children who received an inoculation; the emphasis is increasingly on outcomes—what did the students learn, or are fewer children getting a certain disease? I happen to be a big believer in focusing on outcomes. That said, I’m also quite aware of the difficulties in determining outcomes. Outcomes can be difficult to measure, some of them take years (or even decades) to become visible, some cannot be quantified, and many outcomes are beyond the control of managers and their programs. In recent years, some agencies have begun using what are called “logic models” to analyze and demonstrate the cause-effect chains that can lead to the results they are seeking. A logic model usually spells out a series of steps or activities that, when done well and in a timely manner, lead to a desirable outcome. 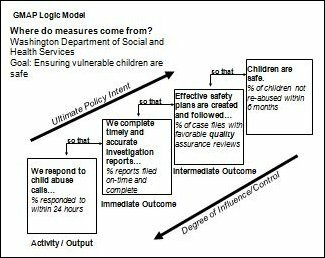 As the graphic shows, the model is based on some assumptions: Faster reporting leads to faster investigations, which results in more effective safety plans, and these plans (when followed) reduce the incidence of children being abused multiple times. If you’re thinking that surely there’s much more involved in keeping children safe than simply fast reporting and quick investigations, you’re right. But the state wanted to start somewhere, and its staff chose a change that it could control. The downward arrow demonstrates which actions are more or less under staff members’ control. Logic models have several advantages, as well as a number of potential downsides. • They help staff see how their actions contribute to the ultimate outcome. • They show what is within the staff’s control. 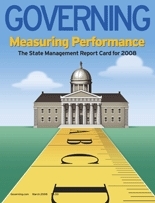 • They focus accountability very specifically; people know what they’re responsible for doing. • They help managers determine whether long-term strategies are working and give them places to look when the strategy falls short. • By design, logic models simplify reality, which can hide significant factors that contribute to complex problems. • Logic models rely on theories of cause-effect; if those theories aren’t based on solid evidence, the whole exercise is suspect. This study forced the staff to rethink their strategy for helping people out of poverty. They made significant changes in their programs, based on different assumptions about what works—that is, they changed their logic model. The new strategy was based on evidence from other anti-poverty programs that were showing real success. And within two years, this agency was producing real and positive change for its clients. This story illustrates one of the most useful aspects of using logic models: the process of developing them can produce important conversations about staff members’ assumptions, which can lead to a search for the evidence on which those assumptions are based. When the evidence isn’t there, it’s time to reevaluate your assumptions.